In an earlier post I described Jezreel’s Tower, the edifice built in Gillingham, Kent, by the followers of James Jershom Jezreel, a group who took the name of the New and Latter House of Israel. It seems fairly certain that this was the monument L.A. Lewis had in mind in his noted supernatural story ‘The Tower of Moab’ (in Tales of the Grotesque, 1934): there are several similarities. The tower in the story was celebrated by David Tibet of Current 93 in his song ‘Lucifer Over London’. 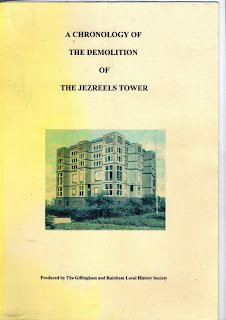 More information about the demolition of Jezreel’s Tower has come to light in a local history pamphlet. The tower had never been completed after the death of the founder and his wife because the group ran out of funds and no doubt impetus and inspiration. Nevertheless, parts of the tower were used by the Jezreelites for some years for offices, meeting rooms and possibly living quarters. Gradually, however, the group's membership dwindled until the vast structure was left entirely to itself. A Chronology of the Demolition of the Jezreels Tower, ‘produced by The Gillingham and Rainham Local History Society’ has no author, date or imprint, but it is a very useful and interesting digest of press reports about the destruction of the tower and, incidentally, about the group. We first learn that the tower had been empty for about 60 years when in 1957 an association of local cricket clubs “showed an interest in making the Tower into an indoor cricket school” for coaching young players. However, the cost of adapting the building was too great. This is a shame, because the image of pale-clad youths “flickering to and fro” in the great stone halls of the Tower seems suitably eerie. A chapter might have been added to my always-hovering study of cricket and the fantastic. In 1959, a local builder, H.A. Smith, bought the site and won planning permission to demolish the tower and build three new factories. There were at once rumours in the town and the local press that it would not happen. Previous attempts had failed, the contractors driven into bankruptcy. There was believed to be a curse, or ‘hoodoo’ as it was described, upon any such endeavour. That ban was soon to be invoked in tragic circumstances. That boy, whoever he was, had a lively style and should have become a writer, preferably of fantastic fiction. 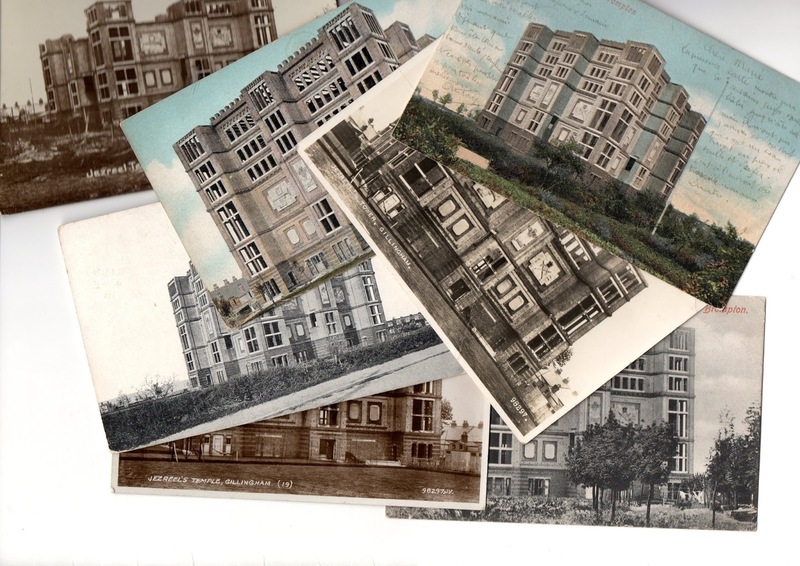 He was also far-sighted: the Tower undoubtedly could have become an eccentric visitor attraction in later years, perhaps converted for some arts and heritage use. The first blow against the tower, according to the reports, was struck in early January 1960, though the paper repeated the story of the peril this was thought to involve: “Many of the local people believed that the ‘curse’ of the Tower would mean that it would never come down’. On 19 January 1960, they may have felt vindicated. A lorry driver involved in the work was killed when “about twenty tons of masonry fell over sixty feet” on top of him. Others “ran for safety but he was trapped and could not escape”. Brown, the owner of the demolition company, explained that he could not account for the accident. The brickwork had been tested the day before and was sound. “It’s a mystery to me,” he said. But he did not accept the local view that it was the ‘jinx’ at work. “It’s a load of rubbish. We shall carry on work as usual. We shall get the Tower down.” But it was not until 25 February, over a month later, that work resumed at the site. By 26 April 1960, the papers reported, “the supposed ‘jinx’ of the Jezreels Tower seemed to be at work” because attempts to demolish the highest walls, variously described as 85 feet or 95 feet high, had failed. But on that date, “after defying all the laws of gravity” for two hours, while it stood with no support, it finally fell. But this was only the first part of the tower. The demolition carried on for many months, and the walls, some 9ft 6ins thick, were described by the builder as “the toughest job of all tough jobs.” It was not until 3 March 1961 that “the last major sections” of Jezreel’s Tower were finally felled. A task that the builder had said would take two months had actually taken a year longer. Local legend had speculated about what might be found behind the foundation stone, which had been left until last during the demolition. Perhaps with memories of the group’s Southcottian origins, some believed there would be a box containing important secrets (Joanna Southcott had left behind just such a box, and advertisements often appeared in almanacs and newspapers announcing that ‘Banditry and the Perplexity of Nations’ would continue until all the bishops of Britain gathered to open it). But in fact when the stone was removed, “in a cavity covered by a copper plate they found a sealed brass jar.” Inside were “two copies of local newspapers dated September 19th, 1885, and a number of coins in new mint condition”, including a gold sovereign, half-sovereign and silver coins: quite conventional foundational mementos. This was not quite the end of the Jezreelite presence in Gillingham, however. Associated with the tower was a row of shops which had once been used by members of the sect, usually involved with various types of hand-work. These were later taken over by a co-operative and at one point housed a baker, shoemaker and so on. Eventually these premises also fell empty, and they were not entirely removed until much later. There was, however, one further, oddly appropriate set of relics left by the sect. Though there were no longer any Jezreelites left in the town, the discussion of the demolition of the Tower had prompted local people to send their reminiscences of the group to the newspapers. The most common recollection was that the men did not cut their hair or beard, but rolled up both into a sort of knot kept in place with stout hair-pins. A member of the local history society reported that his family had moved in 1937 to the house that had been owned by the group’s grave-digger, who had died the year before: and “his tools were still in the loft”. A reader might be interested to see this old print of the tower available on Amazon. Who was that 15 year old boy?! Eccentric Personages - W Russell, LL.D.